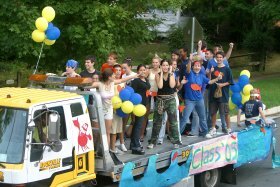 Individual Class Pages: This is a link to the list of B-CC alumni classes which have their own class news page or their own website. Alumni E-Mail News: This is a link to the email newsletters sent out periodically to B-CC alumni. If you would like to be included on the email list, please send your email address to alums@bccedfoundation.org. B-CC's Junior Class seeking help from alumni on "The Highwaymen"
Winners of the Sixth Annual Bethesda-Chevy Chase High School Writing Contest, sponsored jointly by the B-CC HS's English Department, Chips (B-CC HS’s literary-art magazine), the Writer’s Center, and the B-CC HS Educational Foundation, will receive their awards at a special ceremony on Tuesday, May 18, 2010, 3:00-5:00pm at the Writer’s Center, 4508 Walsh Street, Chevy Chase, Maryland 20815. Past members of the Chips staff and alums are invited to join us at this ceremony where this year's winners and this year's Chips contributors will read their work. B-CC HS Educational Foundation Board member Andrea McCarren, a multimedia journalist at WUSA Channel 9, has put together a slide show on the Foundation that can be viewed on YouTube (http://www.youtube.com/user/BCCEdFndn?feature=mhw4) and Facebook (http://www.facebook.com/group.php?gid=232484054968&ref=mf). The music accompanying the slide show, including B-CC's Blue and Gold song, was performed by current B-CC students. As far as we know this is the first time ever that the B-CC song, written in the 1920s, can be heard over the Internet. You can get the text and the score of the song by clicking on the "school song" button at the top of this page. On April 25, 2010, the B-CC HS Educational Foundation co-sponsored with the Town of Chevy Chase an author event to highlight the accomplishments of two B-CC alums, Laurie Strongin ('83) and Sarah Pekkanen ('85), whose books were released this past March. The joint discussion was moderated by former social studies teacher Ed Mullaney (Mr. B-CC). Laurie’s book, Saving Henry, is about her experience giving birth to and raising a boy with a rare chromosomal disease – the medical and ethical issues her family confronted and, most importantly, the lessons learned from a young boy who faced immeasurable challenges but lived his life to the very fullest. Sarah’s book, The Opposite of Me, is a fictional piece about the experiences of twin sisters who have very different looks and personalities. A nice mix of alums and former B-CC faculty listened to the authors discussing the paths that led them to write their books and relating their professional experiences back to their days at B-CC. Almost 200 alums and community members gathered at the B-CC HS Educational Foundation's 4th Annual "Wine, Chocolate, & Cheese" community benefit event on Thursday, March 11, 2010, at the Woman's Club of Chevy Chase. This year’s honoree was Bruce Adams, founder/director of B-CC’s Lazarus Leadership Fellows Program, founder/president of Bethesda Big Train Baseball, and former Montgomery county council member. Please email Carole Brand if you would like to receive an invitation to next year's event. 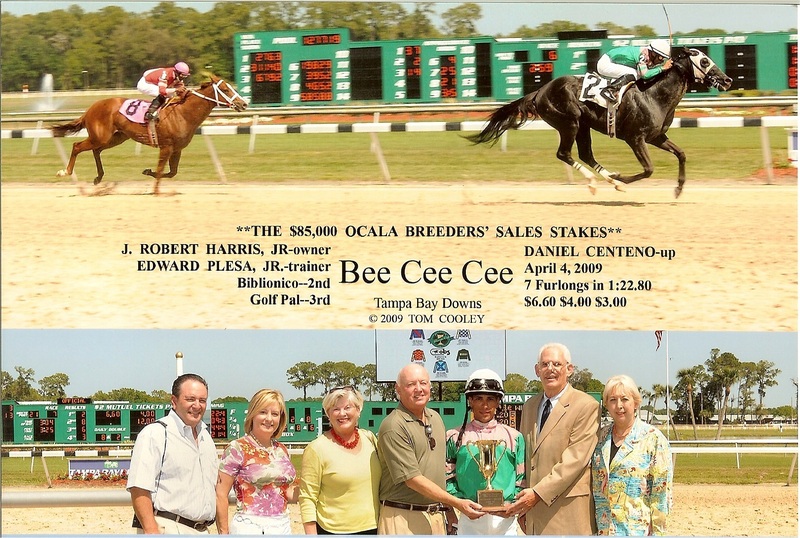 Bob Harris ('36) named his horse BEE CEE CEE after his alma mater. The three-year-old colt has had successes racing in Florida this past year, including a first-place finish in a stake-race on April 4, 2009 at Tampa Bay Downs, shown here in the photo. 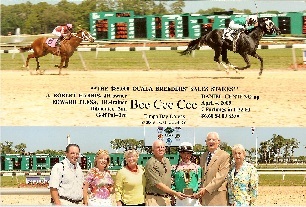 Also in the photo, standing to the jockey's left, are Bob's son, Rob Harris ('66) and Rob's wife, Barbara Burrer Harris ('67). Linda Reid (Yolanda Stassinopoulos, ‘70), along with co-author Deborah Shlian, has a new mystery thriller, Dead Air, released this past December by Oceanview Publishing. Dead Air (Oceanview, IBSN: 978-1-933515-50-2) introduces protagonist Sammy Greene, host of a talk show at a campus radio station. After Sammy discovers the body of Dr. Burton Conrad, one of the college’s most esteemed professors, and starts delving into what happened, several students mysteriously disappear and Sammy’s own life is at risk. 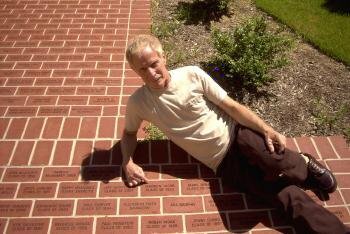 Philip Hutinet ('88) spent the last year re-creating his 1988 "YOUTHQUAKE" mural for the Foundation as a gift to B-CC. The finished mural was unveiled on April 9, 2010 at B-CC's International Night and Student Art Show. "The B-CC murals spoke of the zeitgeist, the spirit of time, in which the students had lived," said Philip at the dedication, "The 30s murals were endowed with that neo-realism quality, the 40-50s with the glee club appeal, the 70s had men with long hair relaxing under a tree and my person favorite, the David Bowie Ziggy stardust mural. Youthquake captures the frenetic alternative music scene of the eighties...." You can see Philip's entire remark at http://bccedfoundation.org/alumni/youthquake.pdf. Synopsis: Set in 1992 in the midst of the Bosnian war, this play follows the parallel stories of two soldiers; one in a kitchen in Sarajevo and the other in a kitchen in Visegrad, both trying to recover a little of the humanity they've lost during the war. A Serbian paramilitary played by Alexander Strain must face the consequences of his own brutality, while a Bosnian resistance fighter, crippled by the limits of his own courage, seeks refuge with a kindred soul. In this play by DC-born playwright Stephanie Zadravec, unlikely partnerships emerge amidst a story of horror, humanity, and stunning relevance. “It's a story of how Bosnians and Serbs, who used to make music together, admire and even love each other, can, in the course of a decade, turn into mortal enemies,” explains Roth. “The play has the courage to show the heart and the still beating conscience in both perpetrator and victim.” Zadravec's work has been presented at The Barrow Group, Bay Street Theatre, Phoenix Theatre, The Kennedy Center, Vital Theater, Mae West Fest, and New York Theatre Barn. Please consider making a difference to a B-CC student's life. B-CC's mentoring program is in need of mentors to help at-risk 9th graders who need encouragement and guidance. Volunteers will meet with the students individually at B-CC once a week, for an hour, after school during the school year, plus a coaching session once a month. Training will be provided. Next session will be on October 13, 2008 at 2:45pm at B-CC, but Debbie Newman, coordinator of the program, will be happy to train and brief volunteers individually. Please email Debbie Newman, or phone her at 240-497-6356. B-CC's 4th annual Golf Classic - Sunday, May 4, 2008, 1:00pm, Poolesville Golf Club. There will be dinner, silent auction, and awards immediately following golf at 6pm (cash bar). You can sign up to play, or to sponsor a hole, or just to attend the dinner/silent auction/awards program. Proceeds from the event will underwrite two needs-based college scholarships, which will be awarded to two B-CC students for outstanding leadership and sportsmanship... More information and sign-up forms are available here. The B-CC Used Book Sale and Literacy & Arts Festival has something for just about everyone. NYT Bestsellers? Washington Post Notable Books? Pulitzers, Nobels, Caldecotts, and Newburys? The B-CC's Used Book Sale has them in abundance. Paperbacks $1; Hardbacks $2. All proceeds benefit the PTSA. Come and hear B-CC musicians, a poetry slam, and Shakespeare. Enjoy a bite to eat while listening to B-CC's musicians. Children's activities all day. Kids can learn Braille and sign language or make puppets. See students' autobiography books. Find out who at B-CC has published a book, recorded a CD, or written a screenplay. Display your works at B-CC's Book Sale and Literary/Arts Festival on Saturday and Sunday, April 5-6, 2008, at B-CC Cafeteria. Please email to Peggy Hsieh a pdf of your book jackets and CD/DVD covers, with a bio that includes your B-CC class year and any personal website. Please send them ASAP so they can be included in the display and binder. Questions? Email Peggy. The story of students in the B-CC cluster helping restore American shad is featured in this award winning book Let the River Run Silver Again! by Sandy Burk, student shad project assistant coordinator and B-CC alumna (1980). The book features B-CC students and all the schools that have helped bring back the American shad to the Potomac. Ms. Burk will be signing books from 11-4 pm on Sunday, March 25, 2007 at B-CC's Used Book Sale/Literacy & Arts Festival. Come by and say hi! All proceeds from the sales of the book at the festival go to the Trout Unlimited fish camp for youth and the fish restoration programs of the B-CC cluster. You can order the book on www.amazon.com or www.mwpubco.com. For more information on the book, go to http://www.mwpubco.com/LetRiverRunSilver.htm. Visit www.potomacriver.org for more information on the current shad restoration program. Michael Zapruder (') performed at the Red and the Black (Joe Englert’s bar, for you DC-ers in the know) on Sunday, Nov. 19 at 8 pm., and Matthew Zapruder (85') read from his new book, The Pajamist, at Politics and Prose, followed by a wine and cheese reception at the bookstore, on Sunday Nov. 26 at 5 pm. 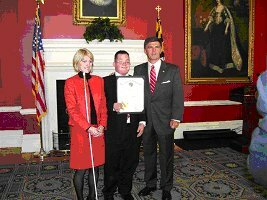 William (Sam) Felling ('06) is the recipient of the 2006 Maryland Distinguished Youth Disability Award. This award acknowledges students with disabilities who have surmounted barriers that have enabled them to achieve their goals and assists students with disabilities to obtain further education or enhance their opportunities to obtain employment. Felling was an exemplary student in high school, ending his tenure with a 4.0 grade point average. Sam is now furthering his education at Montgomery College. All B-CC Alumni are invited to reconnect with old friends this Friday night (Dec. 16, 2005) at B-CC's FABULOUS production, "URINETOWN! The Musical!" Meet before the show at the Alumni table in the lobby, enjoy snacks and drinks (courtesy of Theater Arts Boosters) and take in the show, 7:30-10:30p.m. Scene: Gotham-like city suffering from years of drought. To save water, public pay toilets are only way to "go", and Caldwell B. Cladwell's Urine Good Company controls the monopoly. Those who don't comply are banished to "Urinetown," never to be seen again. This is a HILARIOUS story of greed, corruption, love, revolution, personal liberty, and environmental awareness, all told with tongue firmly in cheek and accompanied by fantastic music and vibrant choreography. If you are a lover of Broadway, here's an extra reward: it spoofs everything from Les Mis to West Side Story. Once again, B-CC Theater is on the cutting edge as one of the first high schools in the nation to stage this show, complete with student-built sets and costumes and B-CC's live orchestra. 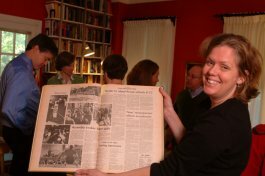 Former editors of the B-CC Tattler (pictured above) from the classes of 1973 and 1974 had an informal Tattler alumni reunion Sunday, October 23, 2005, at the home of the mother of one of their members in Chevy Chase. Most present had not seen each other for over 30 years, but the conversation and discussion picked up from where they had left off. All agreed that none had changed a bit. Many of the former editors are now professional journalists. Among the current employers represented by the assembled Tattler alumni at the reunion are (in no particular order): The Wall Street Journal, The Los Angeles Times, The Boston Globe, The Congressional Quarterly, People magazine, and The Providence [RI] Journal. 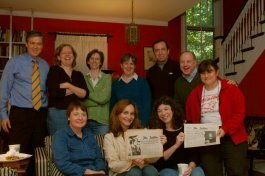 The group unanimously credited the late Ben Allnutt, who taught journalism at B-CC and who was the Tattler adviser for many years, for having taught each of them how to write, for having nutured their interest in journalism, and for having instilled in them an understanding of and desire to achieve professionalism and excellence. They also remembered a late classmate, Mike Bredhoff, the Tattler photographer, whose pictures were truly exceptional and whose contributions to the success of the Tattler in the early '70s cannot be overstated. Matthew von Unwerth (‘88), a former Chips editor at B-CC, did a reading of his just published book, Freud’s Requiem: Memory, Mourning, and the Invisible History of a Summer Walk (Riverhead/Penguin, 2005) at Politics and Prose in Washington, D.C. on October 9, 2005. In a message to Ms. Evanthia Lambrakopolis, B-CC English teacher, Matt wrote. “I live in New York City now .... I’m particularly glad to be able to have the D.C. event at Politics and Prose, which was a regular hangout in the high school days....."
"Psychoanalyst Von Unwerth's lyrical meditation focuses on an obscure and largely unexamined essay of Freud's, "On Transience,".... Emphasizing the literary qualities of Freud's work, and providing various proofs of the aging psychoanalyst's nostalgic relationship to his own past, including the locales of his childhood and the experience of lost adolescent love, Unwerth proffers biographical interpretations of Freud's theories on love, attachment, narcissism, grief and mourning, in an accessible, intriguing and daringly speculative study of a little-known work by the "father of psychoanalysis."" Julia Slavin ('77) first novel, Carnivore's Diet, was published this summer by W. W. Norton & Company. "The surreal invades the quotidian with results both horrific and hilarious in Slavin's first novel, after her well-received collection, The Woman Who Cut Off Her Leg at the Maidstone Club.....Relentlessly weird but also surprisingly moving, Slavin's novel should please any reader ready for a break from the familiar." "This immensely appealing first novel starts out drop-dead funny, then a bit past the halfway mark does a 180 and turns drop-dead serious..... There's almost nothing ordinary about Carnivore Diet, and that's a large part of its appeal. Julia Slavin is daring, sassy and imaginative." Seeking Information on Early B-CC Symbol "The Highwaymen"
The images may be used as a graphic by our class government to promote school spirit by invoking our earlier pre-Baron heritage of those B-CC HS pioneers who made our school great before and during WWII. Please contact me at jeff.eagan@verizon.net or 301 524-5392. I look forward to hearing from you. Feel free to forward this message to anyone who could help. The Class of 1963 Reunion Committee is organizing a 60th birthday party for members of the class. The birthday party will be on Saturday, September 10, 2005, 5-10p.m., at The Woman's Club of Bethesda. The day before the party, there will be a golf tournament at the Falls Road Golf Course in Potomac, on Friday, September 9. You can download the information and reservation form here. More than 30 B-CC graduates, from the classes of 1950 to 1960, gathered in Wilmington, Delaware on April 12 and 13, 2005 to celebrate the 80th birthday of their former teacher, Ms. Ann E. Fullerton. Ms. Fullerton taught Biology at B-CC from 1947 to 1958. These graduates came from Arizona, Connecticut, Delaware, District of Columbia, Florida, Maryland, Minnesota, New Jersey, New York, and North Carolina, to honor a teacher who has had major influence on their lives. Joining in the birthday bash were graduates from New York's North Shore High School, where Ms. Fullerton taught after she left B-CC, and many spouses. DVD copies of the celebration are available for $20 each from Cathy Page Raphael (B-CC Class of 1960). See the party photos and the Wilmington News Journal article on the celebration here. 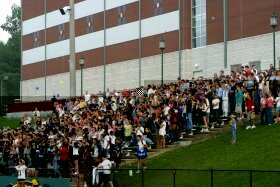 1st Annual Battlin' Barons Golf Classic – Sunday, May 1, 2005, at 1:00p.m. at the Poolesville Golf Club and Potomac Valley Lodge. A silent auction and banquet will immediately follow at 6:00 p.m. Retiring athletic director Brady Blade will be honored at the banquet. Gather your friends for a fun afternoon of golf, or just come to the silent auction and banquet. Proceeds from the event will be used to underwrite two needs-based college scholarships to be awarded annually by the B-CC Sports Booster Club for outstanding sportsmanship. More information and sign-up forms are available here. Tom Reel ('52) and his partner won the Silver Medal in men's tennis doubles, 70-74 age bracket, at the Pennsylvania State Senior Games in June and qualified for the National Senior Games in 2005. 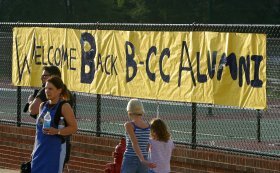 While at B-CC, Tom revitalized the varsity tennis program after it had had no faculty coach or sponsor for several years. Tom was captain of the College of William and Mary tennis team and was one of 64 national collegiate players invited to the NCAA championships in 1956. He served in the Signal Corps., U.S. Army, in Bremerhaven, Germany in 1957 and '58, and was the #1 ranked American military player in northern Germany during that time. Sandy Foulis Waugaman ('58)'s new book, Poor Man's Philanthropist: The Thomas Cannon Story, has just been released by Palari Publishing in August of 2004. It is the story of a man of modest means who has been giving away $1,000 checks to people he reads about in the newspaper since 1972, totaling close to $150,000, all on a postal clerk's salary. Her other book, We're Still Here: Contemporary Virginia Indians Tell Their Stories, coauthored with Danielle Moretti-Langholtz, PhD, is being revised currently. Robert V. Friedenberg ('61) just had the fifth edition of his book, Political Campaign Communication: Principles and Practices, which he coauthored with Judith S. Trent, released by Rowman and Littlefield Publishers. The first edition was published in 1983. Roger W. Titus ('59) took office as a judge of the United States District Court for the District of Maryland (Southern Division) on November 17, 2003. He joins fellow classmate Peter J. Messitte on the bench, bringing to fifty percent the proportion of judges there from the B-CC Class of 1959. Peter Messitte will be celebrating his tenth year on the bench in a few months. Other judges from the Class of 1959 include Thomas L. Craven of the District Court of Maryland and retired judge Richard D. Warren. "We all graduated from an exceptional high school and owe a debt of gratitude to our many fine teachers over the years," wrote Judge Titus. Drew Caylor ('99) has been selected by the Pittsburgh Steelers in the sixth round of the National Football League draft in April, 2004. Drew, a 6'6" and 290 lb center and long snapper, has played four years of varsity football at Stanford University. He was a three sport letter winner in basketball, baseball, and football, and a three-year starter in football at guard and linebacker while at B-CC. He made the All county team twice, as a junior and a senior, and the All state team in his senior year. Drew will graduate from Stanford University this spring with a degree in American Studies. Michael Wiener ('87) played several characters, including a sardonic butler, in "The Slug Bearers of Kayrol Island," the latest modern opera from Obie-MacArthur-Guggenheim award-winning director/writer/artist Ben Katchor, world premiering at the Kitchen in New York in association with the Massachusetts Museum of Contemporary Art; and "At Night", an abstract romantic vignette about a Queens cop and a Village girl, from Headquarters ("Laurel Canyon," "High Art") producing partner Ramsey Fong and director Hyoe Yamamoto starring Michael Wiener and Melora Griffis, premieres at the Tribeca Film Festival in early May. 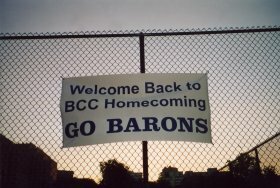 Hurricane Isabel wrecked havoc with B-CC's sports schedule. The Homecoming Parade had to be cancelled and the Homecoming Game was rescheduled to a weekday, September 30. Beautiful signs painted by B-CC students greeted our alums who, for the first time, had a table right on the field near the end zone during the homecoming game. Unfortunately, sad for the fans, B-CC lost to Walter Johnson, 6 to 28. For the first time in many years, our B-CC neighbors were able to enjoy the spirited homecoming parade right in front of their houses. 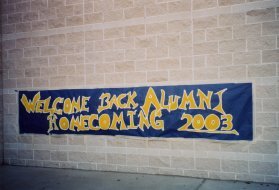 With vehicles no longer allowed inside the B-CC stadium because of the newly installed track, the 2002 homecoming parade took a circular route around the school instead. The theme of this year's homecoming, which took place on September 27, was "Wish Upon a Star". 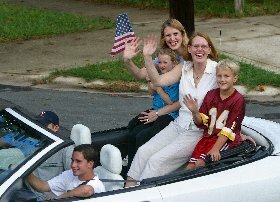 Elizabeth DuPont Spencer ('84) and her sister Caroline Dupont ('86) rode in the homecoming parade with their children. "What a great homecoming!" wrote Elizabeth, "We brought some neighborhood friends along to the game, and our spouses. Fun for B-CC past, present, and future." Alumni from classes '61, '62, '64, '65, '72, '73, '84, '86, '89, and '97 helped cheer the Barons to a thrilling victory over Poolesville (10-7) in the homecoming game. After leading at halftime by 3-0 on a field goal, the Barons gave up a touchdown to Poolesville on a blocked punt midway through the 3rd quarter. In the 4th quarter, a recovered Poolesville fumble by B-CC and a quick 27-yard touchdown pass sealed the Baron's victory. in the bricklined B-CC courtyard. James Biedron ('57) — social studies teacher at B-CC since 1969, also 30-year coach of B-CC's "It's Academic" team. 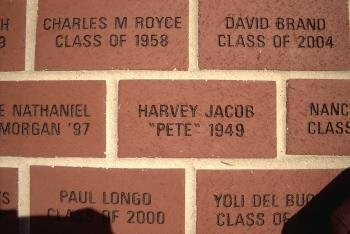 Lawrence Levin — science teacher at B-CC since 1982, also long-time faculty advisor to the Student Government Association. Sharon Wilkie-Mortl — science teacher at B-CC for 15 years, also the mother of a B-CC graduate, Amanda Mortl, Class of 1996. Claire Gargano — secretary at B-CC's main office for 18 years. Diana Drake DeLanoy (’58)—Directory of Academic Library Consortia. This book enables libraries nationwide to share resources within a regionally logical network or grouping. Paul Heintz (aka Mr. Baron ’58)—Flying For Fun. This book is for anyone interested in flying: It is an aviation enthusiast`s sampler about the fun of flying airplanes. Dr. Sara GREENE Kiesler (’58)—Computing and Change on Campus; Culture of the Internet (ed. 1997). This book chronicles the computerization of Carnegie-Mellon University, now perhaps the most computer-intensive university in the world. Drawing on the results of an extensive and systematic research program, Sara Kiesler and other colleagues describe how available resources, behavior, and attitudes to computing evolved campus-wide over the period from 1981 to 1985. James G. Merrill (’58)—When Work Equals Life: The Next Stage in Workplace Violence. This book provides the reader with an understanding of why violence has occurred in work places, the warning signs and how organizations can reduce the possibilities of violence occurring in their organizations. (I. Stockton) Keith Reeves, V, FAIA (’58)—Architects Design Group., Inc.: 30 Years Of Design Excellence; Color and Its Effect on Behavior; Dunlawton: A Florida Sugar Mill Plantation; From the Spirits: Native Arts of The Americas; The People: Art Of Native Americans; & Gendon Herbert—The Koreshan Unity Settlement: 1884-1977 The book was the recipient of a Progressive Architecture Award for Research. Philip Katcher (’59)—The American Soldier; Armies of the American Wars, 1753-1815; Battle History of the Civil War; American Civil War Sourcebook; Brassey's Almanac American Civil War; The Army of Robert E. Lee; Lethal Glory; Great Gambles of the Civil War; Lincoln's Unsung Heros, The Army of Northern Virginia; Building the Victory; Sharpshooters of the Civil War; Encyclopedia of Briths, Provincial, and German Army Units, 1775-1783. Kay Mills (’59)—A Place in the News: From the Women's Pages to the Front Pages (Dodd Mead, 1988); A Place in the News (Columbia University Press, 1990); This Little Light of Mine: The Life of Fannie Lou Hamer (Plume, 1994); From Pocahontas to Power Suits: Everything You Need to Know About Women's History in America (Plume, 1995); Something Better for My Children: How Head Start Has Changed the Lives of Millions of Children (Plume, 1999); Changing Channels: The Civil Rights Case That Transformed Television (University Press of Mississippi, 2004). 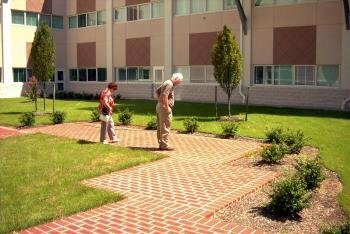 Susan R. Rhodes, Ph.D. ('59) and Richard M. Steers—Managing Employee Absenteeism (Addison-Wesley, 1990); & Mildred Doering and Michael Schuster—The Aging Worker: Research and Recommendations (Sage, 1983). & Judith S. Trent—Political Campaign Communication: Principles and Practices, fifth edition (Rowman and Littlefield Publishers, 2004). Joe W. Haldeman (’61)—Cosmic Laughter, Science Fiction for the Fun of It, improbable people and zany machines are introduced in this collection of nine lighthearted tales (Henry Holt & Co., 1974); Forever War (St. Martins Press, 1974, Ballantine Books 1976, Berkley Pub Group, 1983); Mindbridge, interstellar colonization pioneer Jacques Lefavre is charged with finding an alternative to the imminent war of extinction (St. Martins Press, 1976); All My Sins Remembered interplanetary agent Otto McGavin must find himself among thirty-six unpleasant identities (St. Martins Press, 1977); Worlds: A Novel of the Near Future (Viking Press, 1981); Worlds Apart (Viking Press, 1983); Worlds Enough and Time: The Conclusion of the Worlds Trilogy (William Morrow & Co., 1992); The Forever War 3 (Nbm Pub Co., 1992); Saul's Death and Other Poems, (Anamnesis Press, 1996); Forever Peace (Ace Books, 1997); Forever Free (Ace Books, 1999, 2000); The Coming (Ace Books, 2000, 2001); Worlds (Avon Books, 1990, Victor Gollancz, 2002); Guardian (Ace Books, 2002). Geoff Kurland, M.D. (’63)—My Own Medicine: A Doctor's Life as a Patient, published 9/2002 by Times Books/Henry Holt, a memoir of the author's experience as a physician with a life-threatening illness (an unusual form of leukemia), favorably reviewed by the Sunday New York Times in October, 2002 and was also in the "Briefly Noted" section of the New Yorker in November, 2002. It is not a "How-to-Survive-Leukemia book..."
Jeffrey Saint John Stuart (’63)—Twilight Teams, a historical account of the last season of the 1952 Boston Braves, 1953 St. Louis Browns, 1954 Philadelphia A's, 1957 New York Giants, 1957 Brooklyn Dodgers, and 1972 Washington Senators. William K.S. Wang (’63)—Insider Trading (1996 & Supplement), originally published by Little, Brown & Co., a legal treatise discussing the various laws regulating insider trading and compliance programs that companies should adopt. Paul Karasik (’74) and Judy Karasik—The Ride Together: A Brother and Sister's Memoir of Autism in the Family. Julia Slavin ('77)—The Woman Who Cut Off Her Leg at the Maidstone Club: and Other Stories (Henry Holt & Co., 1999; Picador, 2000);Tin House (Squatters) (Volume 5) (Tin House, 2004); Carnivore Diet: A Novel (W. W. Norton & Co., 2005). David Simon (’78) and Edward Burns—The Corner: A Year in the Life of An Inner City Neighborhood, a New York Times Notable Book of the Year, and HBO miniseries. A.M. Homes (’79)—Things You Should Know, The Safety of Objects which is being made into a movie starring Glenn Close and Dermot Mulroney, and Jack which is going into production at Showtime. Sandy Burke (’80)—Let the River Run Silver Again! How One School Helped Return the American Shad to the Potomac River (McDonald & Woodward, 2005). Tracy Chevalier (’80)—Girl With a Pearl Earring (no. 1 on the New York Times paperback fiction bestseller list in 2001) and Falling Angels. Laurie Strongin (’83)—Saving Henry (2010), an account of the author's experience giving birth to and raising a boy with a rare chromosomal disease: the medical and ethical issues her family confronted and, most importantly, the lessons learned from a young boy who faced immeasurable challenges but lived his life to the very fullest. Aaron Mendelsohn (’84)—Creator and screenwriter of Disney's Air Bud movies, among other feature films, television movies and series; screenwriter of Action Abramowitz, bought by New Line and shooting this spring, starring Ray Romano; currently writing Twice in a Lifetime for James Cameron. Laura Hillenbrand (’85)—Seabiscuit - An American Legend (no. 1 on the New York Times hardcover nonfiction bestseller list in 2001) which is being made into a movie by Universal Studios starring Tobey Maguire and Jeff Bridges. Sarah Pekkanen (’85)—The Opposite of Me (2010), a fictional account of the experiences of twin sisters who have very different looks and personalities. Jennifer Toth (’85)—The Mole People: Life in the Tunnels Beneath New York City, Orphans of the Living, and What Happened to Johnnie Jordan - The Story of a Child Turning Violent. Matthew Zapruder (’85)—American Linden, a book of poetry which won the 2001 Tupelo Press Editor's Prize; The Pajamist (2006). Stefanie Zadravec (’86)—Honey Brown Eyes, a play about the war in Bosnia, was a finalist for the 2007 Smith Prize and a semi-finalist for the 2008 Princess Grace Award, and its world premiere at Theater J in Washington DC in the fall of 2008. Michael Lowenthal (’87)—The Same Embrace (Dutton, '98), and Avoidance (Graywolf, '02). Mariam Naficy (’87)—The Fast Track: The Insider's Guide to Winning Jobs in Management Consulting, Investment Banking and Securities Trading. Alexandra Zapruder (’87)—Salvaged Pages: Young Writers' Diaries of the Holocaust. Yassy Naficy (’89)—Author and screenwriter of The Rogue, a political thriller, to be released in 2012 http://www.imdb.com/title/tt1060269/ More information on Yassy Naficy at http://www.imdb.com/name/nm2202390/bio. Matthew von Unwerth (’88)—Freud’s Requiem: Memory, Mourning and the Invisible History of a Summer Walk (Riverhead/Penguin, 2005). Seth Resnik (’90) and Ron Moskovitz—were awarded the 20th anniversary Don and Gee Nicholl Fellowship in Screenwriting for their work Fire in a Coal Mine in 2005. Sarah Erdman (’92)—Nine Hills to Nambonkaha: Two Years in the Heart of an African Village, a book based on her two years working as a Peace Corp volunteer in a West African village (Picador, 2004). Michael Shipler (’95)—The Dancing Country and Other Stories. Carolyn Feigenbaum (ESOL Department 1981-1999)—A Bench in London: The Story of an American Soldier (2012), a children's book about an American soldier from Chicago who served in the US Army in London during World War II. The book is illustrated by Jordan Cutler (’96) and edited by Deborah Kalb (’81). Do you have news to share with other alumni?